This is the fifth book by the great seventeenth-century Puritan theologian John Owen which has been shortened and simplified by Robert Law. It is divided into five main parts: How we believe Scripture to be the Word of God; Understanding the Mind of God; The Holy Spirit and Prayer; The Holy Spirit as a Comforter; and The Gifts of the Holy Spirit. 196 pages, from Banner of Truth. 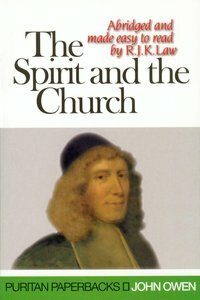 About "The Spirit and the Church (Puritan Paperbacks Series)"
It is the Holy Spirit who convinces, assures, teaches, comforts and equips the church for all the work it is called to do. In an age when many think Christianity is nothing more than human effort based on fallible human conclusions, Owen calls the church back to divine certainty and divine resources. This updated version enables Owen to speak to Christians on a theme as important to the church today as it was to the church in his own day. How do Christians come to the certainty that the Bible is the Word of God, and gain an understanding of His mind and will from it? How do they acquire the ability to pray, and lead others in prayer? how are they comforted and supported in all the difficulties they meet? And how can the church be led, taught and guided aright, when Christ is not here on earth? According to the great Puritan leader John Owen, the answer to all these questions is the same: by the gracious and powerful work of the Holy Spirit. He it is who convinces, assures, teaches, comforts and equips the church and all its members for all the work they are called to do. In an age when many think Christianity is nothing more than human effort, based on fallible human conclusions, Owen calls the church back to divine certainty and divine resources. The style in which the Puritans wrote can present difficulties for modern readers, but this updated abridgement by Dr. R.J.K. Law will allow Owen to speak to Christians today on a theme which remains as vitally important for the well-being of the church in the twenty-first century as it was when Owen first wrote. John Owen (1616-1683) was an early Puritan advocate of Congregationalism and Reformed theology. Educated at Queen's College, Oxford, he served under the Puritan government of Oliver Cromwell as personal chaplain to Cromwell and later as vice-chancellor of Oxford. A contemporary of John Bunyan, Owen's extensive body of work includes twenty-eight books on theological and devotional themes. His later years were spent in pastoral ministry where he served as the leading spokesman for the Protestant Nonconformists. His best known writings have been compiled in the encyclopaedic The Complete Works of John Owen (16 volumes) and The Book of Hebrews (7 volumes).-Editorial Review.